Mitsubishi split-zoning systems are specifically designed to improve the comfort level in an uncomfortably hot or cold room of an existing building. Because they don't require ductwork, they're the perfect heating and cooling systems for renovating older buildings that were constructed before air conditioning was available - even those with plaster walls and brick facades. The versatility and variety of applications for Mitsubishi Electric systems are virtually unlimited. They're an excellent choice for almost any spot cooling or heating situation, including enclosed sunrooms, upstairs bedrooms, classrooms, hospitals, nursing homes, restaurants, hotels, workout rooms, computer rooms, offices and churches. 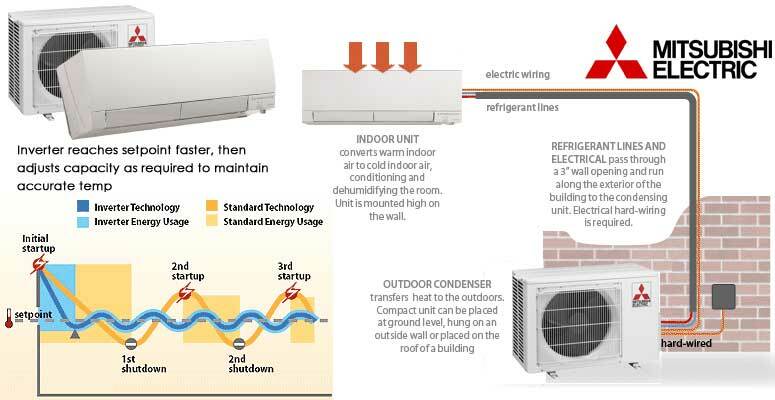 Mitsubishi Electric Cooling & Heating can fit into almost any space because their innovative engineering optimizes the capabilities of the INVERTER technology and R410A refrigerant for more efficient systems with smaller indoor and outdoor units. R410A refrigerant is environmentally friendly, with zero Ozone Depletion Potential (ODP). The units themselves are also made of recyclable materials. Type of Unit: The price of a mini split unit varies depending on whether the unit is for single-zone heating and cooling or multi-zone heating and cooling. Efficiency Level: The energy efficiency level of a mini split affects its price considerably. It is usually determined by the energy efficiency rating. A unit with a higher SEER value will cost more than one with a lower SEER value. Features: The price can also be affected by the differences in built-in features. 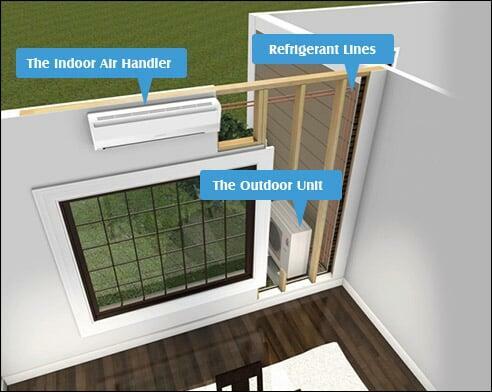 Ductless units with advanced features cost more than those with just standard features. Integrated Technology: The more the advanced components a unit has, the more it is likely to cost compared to others. Quick heating technology and the advanced compressor systems are two great examples of integrated technologies that can make a unit cost more. Installation Complexity: The age and size of your home are some of the factors that can lead to a complex installation. The more complex the work required the higher the associated labor costs. Number of Air Handlers: Air handlers are used for temperature zoning application. The more of those that are required, the higher the costs you are likely to incur. It really comes down to whether you need a single zone installation or a multi-zone installation.